Konark SWR(Soil Waste Rain water) system conform to IS 13592 (Pipes) and IS 14735-is an efficient drainage system for all sizes of buildings in urban and rural areas. Available in Selfit and Ring-O-Socket system in 63mm, 75mm, 90mm, 110mm and 160mm. In order to keep pace with the never-ending demands of customers, we are involved in offering a wide range of SWRF Flange. SWR Single TEE is available in 75 mm and 110 mm made in virgin material. 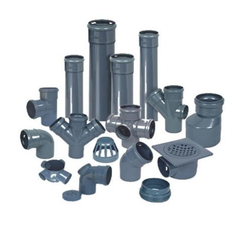 As we are considered one of the well known organizations, we are involved in offering a quality range of UPVC SWR Fittings. These fittings are available in different sizes and dimensions as per the specifications of our esteemed clients. All these items are well designed by the team of expert engineers and efficient workers. 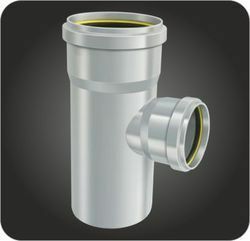 SWR PIPES sizes from 20 mm to 200 mm and in pressure rating of 2.5, 4, 6 and 10kgf/cm2, in light grey colour. Manufacturer of SWR PIPE FITTING SEAL & O-RING. Our product range also comprises of Injection Moulds, Rubber Moulds and Bakelite Moulds.